Alfred A. Knopf Books for Young Readers, 9780375858949, 40pp. Life under the sea can be as dull as dishwater, until Barry arrives, that is. 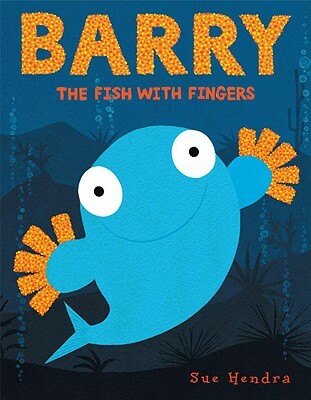 See, Barry is no ordinary fish--he's a fish with "fingers" And fingers mean finger puppets, finger painting, knitting, counting to ten, tickling, and all sorts of fun things. It isn't long before all of the other fish want fingers, too. Life under the sea will never be the same again. . . .
Sue Hendra's hilarious text and bright, bold, colorful art will have youngsters begging to read this story again and again. SUE HENDRA graduated from the University of Brighton, in England, with a degree in illustration. She has illustrated over seventy books for children, including Monsters Don't Eat Broccoli by Barbara Jean Hicks. When she's not busy making books, Sue helps run an art club for children at two of her local museums. Sue Hendra lives in Brighton, where she loves to swim, explore the surrounding countryside, and eat fish-finger sandwiches, much to Barry's chagrin.